Eleven editorial roles are set to be cut at a group of London weeklies with the National Union of Journalists claiming all but two of its 29-strong newsroom are now on notice of redundancy. According to the NUJ, regional publisher Newsquest wants to axe a series of roles in its South London newsroom which produces ten newspapers and eight companion websites across the area. The union says the company has told staff that it plans to cut four reporters, three sub-editors, two content editors, an editorial assistant and a deputy managing editor by mid-October. The remaining 18-strong newsroom would comprise a managing editor, web editor, 12 reporters and four content editors, responsible for covering features, sport and leisure across the patch as well as news. Titles that would be affected by the proposals include the Guardian series in Croydon, Epsom, Kingston, Richmond, Sutton, Wandsworth and Wimbledon, the News Shopper series covering Bexley, Bromley, Dartford, Gravesend, and Greenwich, the Richmond & Twickenham Times and Surrey Comet. Prior to the latest announcement, Newsquest’s staff had already been balloting for industrial action over staffing levels and related issues, saying that eight members of staff who have left since April have not been replaced. Earlier this week HTFP also reported that the South London titles would no longer have professional photography coverage after Newsquest ended a decade-long agreement with the Deadlinepix agency. 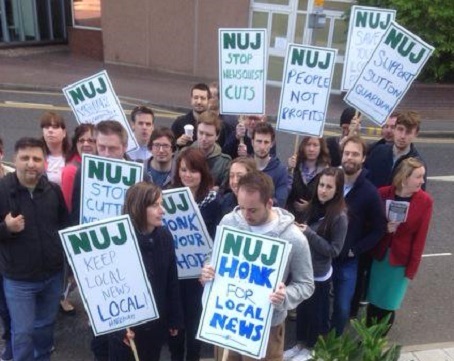 An NUJ chapel spokesperson said: “These new proposals will not only destroy our already struggling news room and ruin the brands we have worked hard to build up, but they are quite simply unworkable. According to the union, the company cited “difficult trading conditions with sustained pressure on the profitability of the group” in making the announcement. A group of national newspaper journalists has also pledged to set up a hardship fund for the Newsquest South London staff should they decide to go on strike. The NUJ chapel at the Financial Times passed a motion saying it “fully supports” NUJ members balloting for strike action. “By allowing local news titles in South London to be produced by skeleton staff teams and work experience students, managers are showing their contempt for both journalists and journalism,” it said. Can’t imagine how anyone could afford to be on a reporter’s wage in London. Do all the people in that picture live in the same flat? Making do with the thinest of skeleton staffs working under intense pressure doing the work of colleagues who are deemed surplus to requirements all under the banner of cost saving measures and efficiencies is not a long term strategy for companies or individuals. Terrible news for those concerned – but the more these established titles are cut back, the bigger a gap it creates in the market for an enterprising start-up. I’m not suggesting it’s within the grasp of a poorly-paid trainee to do so, but someone with deeper pockets is bound to take the initiative eventually. A couple of independents have sprung up in my neck of the wood following TM / NQ cuts and they seem to be going from strength to strength. They certainly run rings around their rivals for depth and relevance of coverage. Nonetheless, my sympathies to anyone caught up in this mess. It must be awful to finally land a coveted journo job, only to find it’s not much fun and you’re at risk of losing it. Makes you wonder whatever the future holds for some of these papers, companies and individuals with the cloth spread so thin and with the poor souls who remain living on a knife edge and loving life at near breaking point. Very sorry to hear about yet more job losses at NQ. However, there is life after NQ and newspapers. Firstly you have to have sympathy for all the dedicated employees up and down the country who are under consultation. On my commute home I’ve been trying to think of any successful weekly newspapers that operate in metropolitan / conurbational areas – do they exist? Can anyone out there please point me in the right direction? Job cuts have become a way of life in regional journalism over the past 10 year, but what is now more alarming is the slashing of roles such as content editors. Weren’t these supposed to be part of the brave new world in the industry?